Q: What are the most common food allergens? A: Beef, chicken, wheat, corn, soy, dairy, egg, and fish. Q: How is a food allergy diagnosed? 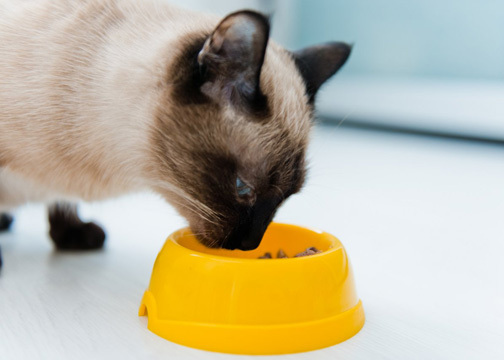 A: After careful consideration of your pet’s previous diets the veterinary dermatologist will direct you to an appropriate home cooked or commercial pet food. Q: What about lamb, the dog food bag says it is hypoallergenic? A: In spite of advertising claims, lamb is not always hypoallergenic and can be implicated in food allergy if fed over a period of time, likewise to other ingredients fed over time. In fact, in Great Britain, where lamb or mutton is commonly fed, lamb is the major cause of food allergy in dogs and cats. Q: My pet has been eating the same food for a long time, could it still be food allergic? A: Since most commercial pet foods contain approximately the same ingredients, and most animals with food allergies have been eating the same diet for some time, changing (or not changing) the brand of food does not typically alter the symptoms. Q: How long will my pet eat this diet? A: Traditional novel protein diets take 8-12 weeks at the discretion of the veterinary dermatologist. Newer, hydrolyzed diets may only take up to 6 weeks to see improvement. Q: What if my pet accidentally eats another pet’s food or table scraps? A: The food trial starts over, even occasional transgressions in the food trial can seriously hinder our ability to make the diagnosis of a food allergy. Make sure that all family members and visitors to your home know that your pet is eating a prescription diet. Q: How will I know the diet is working? A: Your pet will no longer relapse with secondary infection or suffer from pruritus by the end of the 8-12 week dietary trial. Q: I already have my pet on a grain free diet, is this adequate for a food trial? A: In the published list of known food allergens there are both protein and grain allergens. The dermatologist will specifically direct you to appropriate home cooked or commercially available diets. Q: Are there any treats I can give? A: Nothing but the new food and water are to pass the lips of a patient on a food trial. Q: What about the flavored heartworm prevention I give my pet? A: The heartworm prevention is even changed to a non-flavored product. Current options are unflavored Heartgard® tablets or topical products such as Revolution® or Advantage Multi®. Please discuss changes with the dermatologist or your family veterinarian. Q: If my pet improves on the test diet, do I have to continue to feed it for the rest of his or her life? Ease and cost of obtaining a limited ingredient pet food (example: corn free diet if your pet is corn allergic). Q: How will I know exactly what food my pet is allergic to? A: The dermatologist will direct you through a food challenge at the end of the 8-12 week hypoallergenic diet trial. This entails adding specific ingredients individually to your pet’s hypoallergenic diet according to a calendar. Most patients will have an adverse reaction, such as a flare of red, itchy skin, within 24-48 hours of being exposed to the offending allergen, but some patients may take up to 10 days. Q: How will I know my pet is having a reaction to a food ingredient? A: Usually within hours to just a few days your pet will have relapsed with skin problems as it was prior to feeding the new diet. Q: Can there be more than one ingredient my pet is allergic to? A: Usually there is just one ingredient, on occasion a patient will have multiple food allergens. For this reason, you should proceed with the entire challenge set forth by the veterinary dermatologist.